Since moving into our new place I've been looking forward to setting up my telescope for a little astrophotography. I was initially concerned about the light pollution, but I figured since Hogue Park was only a block away and since the SJAA has star parties there all the time, it might not be that bad. Last night was a pretty good night for sky transparency and since the moon was rising late it seemed like a good candidate. I first tried out a couple of quick star trails with just my camera on a tripod; unsatisfied I proceeded to setup my telescope. With the house and the back fence a lot of the sky is occluded. Fortunately there is a clear view of Polaris so setting up the EQ wedge was no problem. The GPS receiver also managed get a signal very quickly (something I was worried about due to issues I have had with the receiver in Canada). The scope wanted to use Sirius and Aldebaran for alignment, since Sirius was occluded I didn't do the alignment (I figured since I was interested mainly in some photography of larger objects I could manually find them). I did one quick shot of the night sky with the fisheye lens piggy-backed. I was after two things last night, the Pleides star cluster and the Orion Nebula. 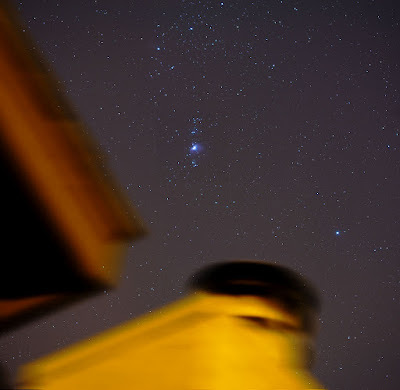 Since Orion was still occluded behind the house, I did Pleides first (with the 100mm lens). Once Orion had risen, I did a series of exposures with the 100mm lens which is the image posted here. I then un-mounted the camera and attached it to the scope for some prime focus astrophotography. The biggest pain was naturally getting focus. I used an angle finder to approximate the focus, then just kept taking test shots as I turned the focussing knob. Surprisingly it only took about 5-6 test shots to get proper focus. I did a series of 14 shots at 15s for each one. I assembled, aligned and processed them in both Photoshop and RegiStax (the image in PBase is the Photoshop one, the Registax version does a little better at alignment but otherwise the results are very close). For such a crude setup I think the results are promising, so I'm looking forward to doing some more astrophotography from the backyard. The 'Pleides' shots didn't turn out as well, so I'll probably try that next time. Technical Specs: Canon 5D, 100mm Macro piggy-backed on a Meade LX90, 9 shots stacked @ f/4 and 30s, ISO 800. Nice! Definitely good for a quick attempt. If only Orion could be up during the summer months! It's too cold to try to take a picture of it from here. Oh, if you have clear skies at sunrise or sunset you should try to catch Comet McNaught... apparently it is getting quite bright now. The next couple of days aren't good transparency wise, but the sunrises and sunsets do tend to be clear (when its generally clear), so I'll try to see if I can find that comet. Welcome back. Very nice. After seeing your pictures, astrophotography sounds very interesting to me. Then again, astropornography might be a better word.